If only one photo survives the nuclear apocalypse, I hope it’s this one. 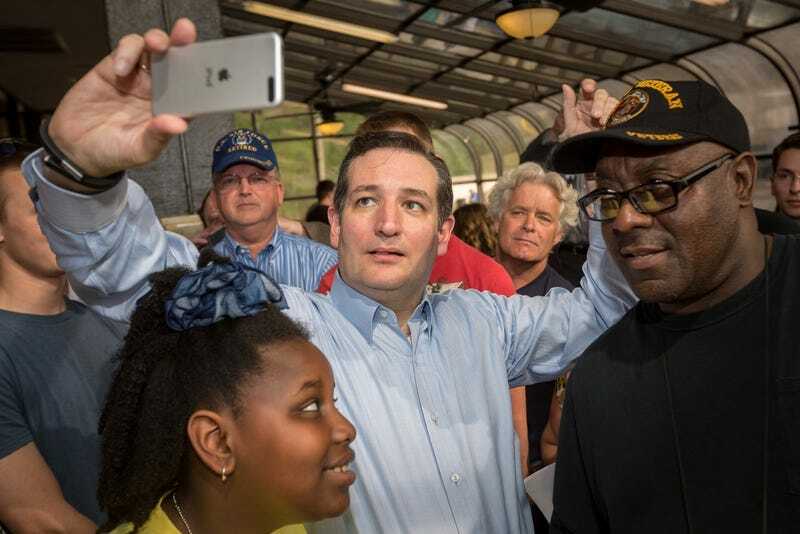 Ted Cruz is taking a selfie with confused onlookers as his other hand hangs in the air like normal humans would pose. This photo sums up politics in 2016 as far as I’m concerned. The Presidential campaign trail is rough. In the old days, you’d pose for a million photos with fellow politicians or by cutting the ribbon on some new bridge with giant scissors or making a speech on the back of a train. But gone are the days when a presidential candidate could have some distance from the crowd. Here in the early 21st century, if you want to be president you need to get right down in the thick of it. You’re not just a candidate anymore, and you’re not just shaking hands and kissing babies. In the age of the selfie, you’re often the photographer. So today, we present a snapshot (sorry) of political photography in the age of the selfie. Because we don’t know for certain what the future of self-photography holds. Maybe people of tomorrow will have hoverphones, or all human heads will be replaced with one giant camera lens. Or maybe an EMP attack will free us from our devices, and we’ll start life anew as an agrarian society. I don’t know. But we can make a pretty safe bet that if the internet persists today’s photos will look even more awkward with age. If you’re reading this blog post in the year 2026, just know that we think this form of campaigning looks as silly as you do. What a time to be alive. Do you see him? Do you see the man back there? Look behind you before it’s too late! I’m not 100 percent convinced that those young women know that Ted Cruz is in their selfie. But photobomber or not, his awkward smile pretty much sums up every selfie you’ll find of Cruz. “I just wanted a selfie,” the creeped out girl thought to herself as she slowly tried to squirm her way from the orange man’s clutches. When it comes to technology we know two things about Jeb! : 1) He loves Apple products and 2) He recently discovered that his Apple Watch could tell time. I’m not entirely sure what kind of angle Jeb is fixing on here, but hopefully he’s not just checking to see if that iPhone has the time. Whatever your political leanings, you kind of have to admit that Hillary Clinton is the natural selfie candidate. She’s more than happy to take selfies with anyone, even if they’re using a tablet rather than the more traditional selfie enabler: the smartphone. She usually looks pretty comfortable doing it too. Unlike so many of the other candidates. I’m going to be honest with you: I couldn’t find many photos of people taking selfies with John Kasich. And if we’re being brutally honest, it’s hard to find photos of John Kasich period. The most awkward Carly Fiorina selfies predate her run for the Republican nomination. Most photos you’ll find of her posing for selfies in 2016 are simply the look of a tired person on the campaign trail. But this photo from 2005—a magical age before the term selfie would even enter the national lexicon—is truly a selfie gem that I had to include, despite the fact that she has dropped out. Yep, that’s Gwen Stefani taking a selfie with Carly Fiorina at CES. To be fair to Marco Rubio, he clearly doesn’t know that his photo is being taken here. But that kind of sums up the modern election cycle as well. Everything a candidate does is always being documented, whether they know it or not. Ben Carson seems like a nice guy and let’s just leave it at that. And finally we have a BernieBro who may or may not know that he’s posing with a cardboard cutout of Sanders. Either way, it’s a whole new level of self-ifying. If you have any political selfies you’d like to share in the comments, please do.